This B747-100 serial number 20247 was built in 1971 for Delta Air Lines (N9900). Cnverted into a cargo version six years later and purchased by Flying Tiger Line with the registration N805FT. Flying there till 1989. It was purchased by Federal Express (N625FE) the same year. Four years later flew for Air Hong Kong (VR-HKC). 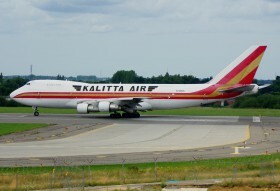 By American International Airways (N625PL) in 1994, in service by Kalitta Air (N709CK) since 2000. 20.10.2004, on a flight from Chicago to New York City, the device showed that engine number 1 lost power at an altitude of approximately 11,000 m. The pilots decided for visual control, but saw only the pylon without engine. Aircraft without minor problems landed at the airport Detroit safely. This aircraft was written from use after 39 years since its first flight. 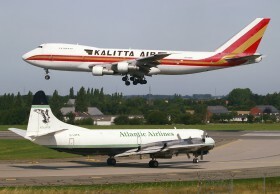 Two old timers in action... N709CK built 1971 and G-LOFB built 1961.